This week we attended an event in the Scottish Parliament, to celebrate 25+ years of the LEADER programme in Scotland. LEADER is the EU’s rural development programme, and is a proven success story in delivering results for community-led projects. 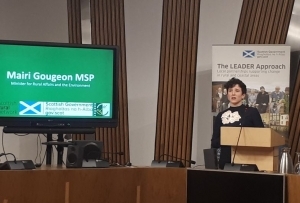 The event was hosted by Bruce Crawford MSP and featured a keynote speech from former ESEC chair, Mairi Gougeon MSP, who is thriving in her role as Minister for Rural Affairs and the Environment. During the event, we were treated to two short videos on LEADER-funded projects being delivered across Scotland’s rural communities. What was striking was the diversity of these projects – LEADER has supported projects including tea growers, youth music groups, orchards, tea growers, glamping facilities, alpaca walkers, and even eel conservation. Another striking feature of the LEADER programme is the long-term impact and legacy of projects. Initial investment from LEADER has allowed projects to build on their potential and become key economic drivers in their communities. Over the years, LEADER has delivered demonstrable results and achievements and there are many lessons to be learned from this community-driven, bottom-up approach when thinking about the design of future funding programmes, especially when considering what will support our vital rural communities after Brexit. For more information, watch this short video or follow #LEADERlegacy on Twitter.